So, who's going? We should meet up in the reals of life. Last edited by zemming on Thu Jul 24, 2014 4:41 am, edited 1 time in total. WOOO!!! I'll be there Thursday through Monday. I'm not sure how easy it'll be to organize a meetup, but I'm game. Are we looking for a meet up, say hi and whatnot, or are we looking for more of a party room, hang out thing? EDIT: Hijacking this for visibility. Let's meet at the Five Guys at 1800 (6pm) on Thursday. I'll probably hang out in the Charles Street Lobby of the BCC, then start walking at 1800. It's only like 5 minutes away, so it should work out fine. Someone should have some FoE merch or something so we can recognize the group. Or I guess we can just stumble into each other at Five Guys. I have attached a screenshot of the 100 level map, where Registration and the Charles Street Lobby are, as well a screenshot of google maps in case you can't walk in a straight line. Five Guys is in the little complex (IIRC) on the second floor. So go in the middle entrance, take the stairs, and it's right there. Last edited by zemming on Thu Jul 24, 2014 4:40 am, edited 1 time in total. Ill be there from 31st of July to 4th of August. Any of you going to the crawl Thursday night? Aww yeah. I'll be there. Also, what's "the crawl"? I'll be there all weekend as well. Hoping someone suggests a meetup location. Just to throw it out there, there's a Five Guys only about half a block from the convention center... though I am already planning on meeting up with a group of Second Life friends there at another time. Worldenterer wrote: Aww yeah. I'll be there. Also, what's "the crawl"? It's a bar hop thing Thursday night put on by Crawl Baltimore. 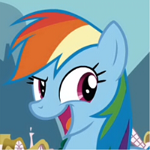 Here's the bronycon page, and the eventbrite page. zemming wrote: It's a bar hop thing Thursday night put on by Crawl Baltimore. Here's the bronycon page, and the eventbrite page. Ah, ok. Yeah, I'd rather spend time at the con, not to mention I wouldn't be able to get into those bars. I never did get a fake ID. FancyCat2008 wrote: I'll be there all weekend as well. Hoping someone suggests a meetup location. zemming wrote: WOOO!!! I'll be there Thursday through Monday. I'm so very interested in a meetup. Yes. Five Guys doesn't sound too bad! It's not as expensive as many of the other places, and typically comes with free nuts! Who doesn't love free nuts?! Worldenterer wrote: Ah, ok. Yeah, I'd rather spend time at the con, not to mention I wouldn't be able to get into those bars. I never did get a fake ID. The shenanigans that took place was more alligned with the individuals, not the actual event itself. I too will not be going(despite my legal age), as I don't have the funds fer something likes that. Last edited by PrismSpark on Wed Jul 23, 2014 12:21 pm, edited 1 time in total. zemming is trying to convince me to come.